Do Oysters Contain Omega 3? Sodium is found in table salt and almost all foods, and this mineral is essential to your body's healthy functioning. However, excessive sodium intake is cause for concern. Unless you need to follow a very low-sodium diet, oysters are a relatively low-sodium food. 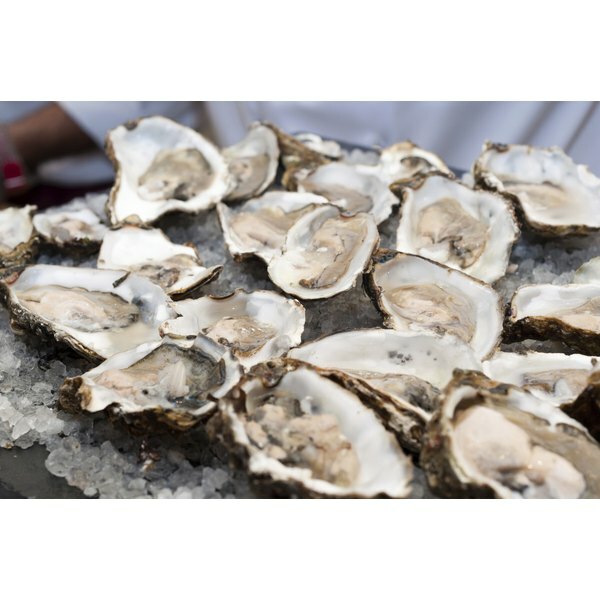 If you have a medical condition necessitating a low-sodium diet -- heart failure, Ménière's disease, kidney disease, cirrhosis and diabetes are some examples -- ask your doctor whether it is safe for you to eat oysters. According to the USDA standard nutrient database, a single medium-sized raw Pacific oyster contains 40 calories, 4.7 g of protein, 1.2 g of fat and 2.5 g of carbohydrates. A single medium-sized oyster has an average weight of 50 g. Small quantities of calcium, magnesium, iron, potassium, phosphorus, zinc, copper, selenium and manganese are present in a raw oyster. The sodium content of a 50-g raw Pacific oyster is 53 mg. Different types of oysters have different nutritional profiles and sodium contents. For example, raw Eastern oysters harvested from the wild contain only 26 calories per 50-g serving, significantly less than the Pacific raw oyster. The protein, fat and carbohydrate content of Eastern oysters is higher than that of Pacific oysters, at 9.5 g, 2.3 g and 5 g, respectively. The sodium content of Eastern oysters is slightly lower than that of Pacific oysters, at 42 mg per 50-g serving. As Eastern oysters are smaller, 50 g represents three to four individual oysters. According to the Mayo Clinic, an upper daily sodium limit for healthy adults is 2,300 mg. In practice, most adults living in the United States consume more sodium than is considered healthy. Excessive sodium intake can lead to a range of health problems, including hypertension, also known as high blood pressure. For optimum health, the Mayo Clinic recommends you consume no more than 1,500 mg of sodium daily. If you ate no other foods containing sodium for the rest of the day, you could maintain a sodium limit of 1,500 mg by consuming either 1,400 g of raw Pacific oysters or 1,785 g of Eastern oysters. The sodium values given for raw oysters do not take into account different cooking or preparation methods. The sodium content of canned oysters is higher than that of wild raw oysters -- a 50-g serving of canned oysters contains 66 mg of sodium. Likewise, any dipping sauces or condiments you consume together with oysters can significantly increase the sodium content of the meal. If you have concerns or questions about your health and your sodium intake, contact your health-care provider.